Gravity Wall System, precast elements are backfilled using compactable on-site earth materials – 42% less additional excavating required than for Geo-Grid walls. 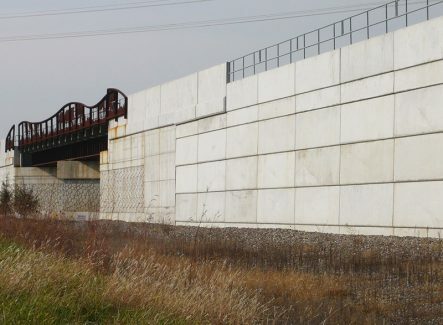 A closed-face gravity retaining wall system, capable of supporting high loads, efficient to construct, made of precast concrete for longevity and all based on a design method with a forty-year history of success. A Gravity Wall system utilizes precast concrete elements that are backfilled with compactable, on-site materials and creates a 42% narrower footprint, which means less excavation and less temporary hillside shoring than required for Geo-Grid walls. Precast Reinforced Concrete for Longevity, elements are precision cast in steel molds, using 5000-psi concrete by NPCA Certified producers. Learn more about EVERGREEN’s latest projects and applications as well as recommendations from clients and various white papers. Download information about Evergreen Walls for contractors, licensees and landscaping designers along with many applications for DOTs and site developers. Read about the development of the superior engineering of Evergreen Wall systems and what makes them so unique. 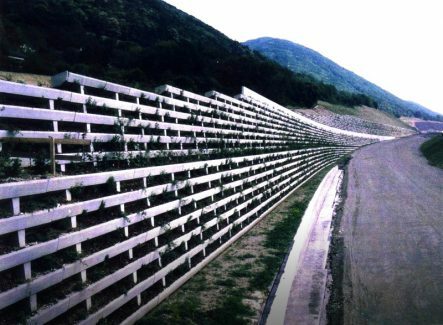 The first EVERGREEN® wall was erected in 1978 and, since then, over 1500 walls have been built worldwide. Every EVERGREEN® wall ever built is still in use: this is the most significant evidence that all EVERGREEN® walls are reliable and cost-effective solutions for many applications. With twenty plus years of experience in civil/underground construction and precasting of concrete products, in 1985 the Evergreen licensees recruited Clay to be the liaison between Evergreen in Europe and Evergreen activity within North America. FELIX JAECKLIN, PH.D., M. SC. Dr. Jaecklin was the owner and president of the geotechnical consulting company ‘Dr. Felix P. Jaecklin, Geotechnical Engineering’ (1974 – 2000) for geotechnical design in deep excavations, shoring, piling and retaining walls.